America's capital city is about more than government. What was once a town that lawmakers would flee every Thursday has now become a cultural center, home to top restaurants and exciting museums. Take some time to visit the newly renovated Newseum and find out how the news is produced. 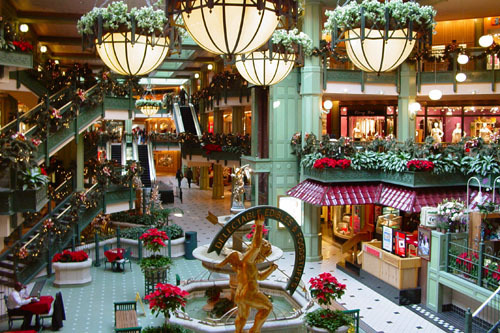 Or stroll through swanky Georgetown and linger at upscale shops and restaurants. Of course, no visit to Washington, D.C is complete without a tour of the Capitol Building and the Smithsonian. Visitors with extra time on their hands should visit Mount Vernon and Monticello, the residences of George Washington and Thomas Jefferson respectively. Calling all cars! Calling all cars! and CSI wannabes, Law and Order fans and amateur detectives. 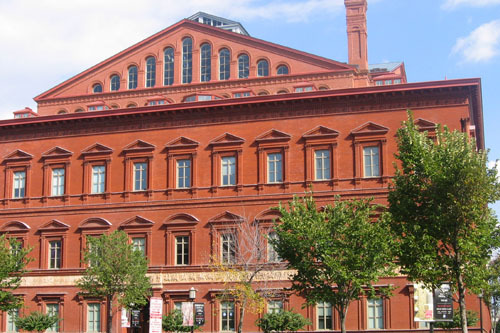 Make your way to one of Washington's newer museums, the National Crime and Punishment Museum. 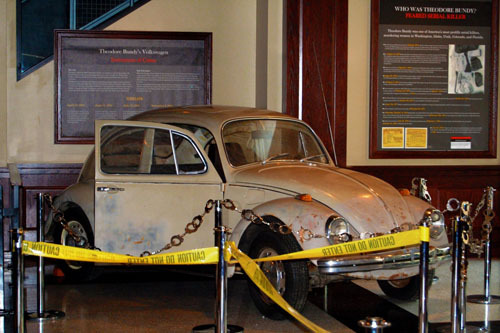 The museum depicts the different aspects of crime investigation. Upon entering, visitor walk into a set up murder scene. Exhitbits show how investigators look for clues with fingerprints, ballistics, and DNA. The museum also traces criminals throughout history from the Pirates of the Carribean to today's corporate criminals. Punishment is given equal treatment with reproductions of a guillotine and an electric chair from the Tennessee State Penitentiary. Several interactive exhibits including a virtual target range and a crime lab can keep visitors busy for hours. 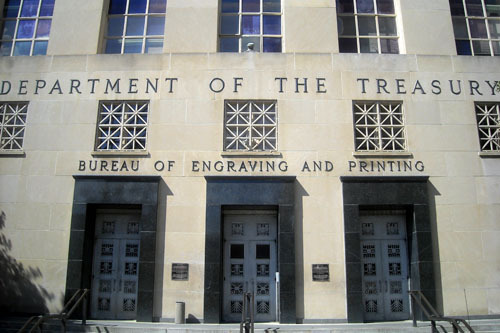 At the Bureau of Engraving and Printing, visitors on the guided tour can watch how paper money is printed and cut as it comes off the rolls. It is here where every father can point to the machines, proving to his children that money does not grow on trees. The printing process can be viewed by 35 minute guided tour only. Timed tickets are handed out when the visitors center opens, usually at 8 AM. Note the touring schedules are more limited than the visitor center's hours. Also, this is a very popular site. During the more popular times (Cherry Blossom Season, Summer) tickets may have been distributed within the first hour of availability. No reservations are accepted. A visit to the BEP is a fun experience, even if they do not give out free samples. A phrase taken from the Busboys and Poets mission statement reads '… a place to take a deliberate pause and feed your mind, body and soul… a space for art, culture and politics to intentionally collide…' which owner, Andy Shallal, believes will create a space that will inspire social change and begin to transform the community and the world. 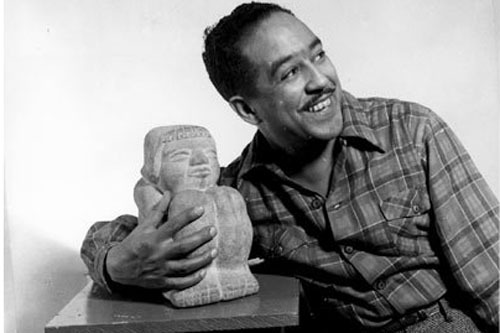 Centered in the 'cultural hub' of Washington D.C., Busboy and Poets was named in honor of Langston Hughes who worked as a busboy while writing poetry. While, first and foremost a restaurant, Busboy and Poets also houses a bookstore, bar, coffee shop, theater space, and lounge… and all-around community gathering place. There are three more locations located throughout the D.C. Metro area. Busboys and Poets are earth-friendly relying on 100 percent wind-powered energy and using bio-plastic products derived from renewable sources. 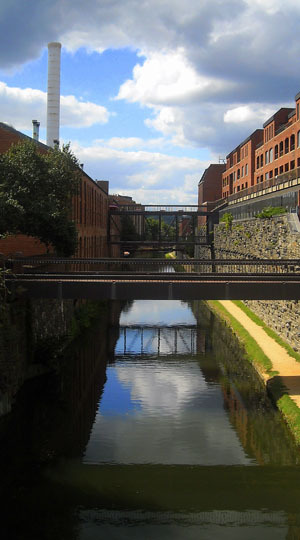 The Chesapeake and Ohio Canal (C & O Canal) is one of the jewels of the Georgetown neighborhood. Initially designed to bring coal from the Appalachian Mountains to the nation’s capital, the canal fell into disuse and virtually forgotton about after the advent of railroads. In 1971, the canal was declared a National Historic Park. Today, the canal is a popular place to bike, jog or take a leisurely stroll. The former mule trail takes you behind the row house of Georgetown and near Georgetown University. Those with enough stamina can try to complete the 184 mile journey to Cumberland, MD. But, you’ll probably miss your connecting flight. National Park rangers take visitors on mule powered barge rides through the backyards of Georgetown. The rides are offered for a nominal fee and are available from late June to early September, with limited operations in April, May and October. Senior Price: 8 $ (8.00 USD), Senior (62+) general admission and admission to special exhibits. 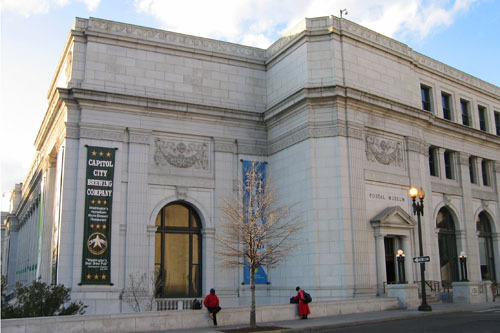 The Corcoran Gallery of Art was the first major art museum in Washington, DC, opening in 1869. 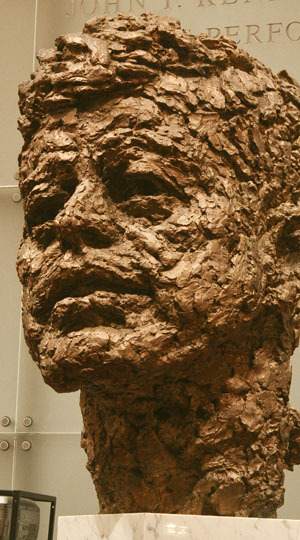 It was also one of the first museums to focus on American artists. Today, the collection also contains works of the European masters. 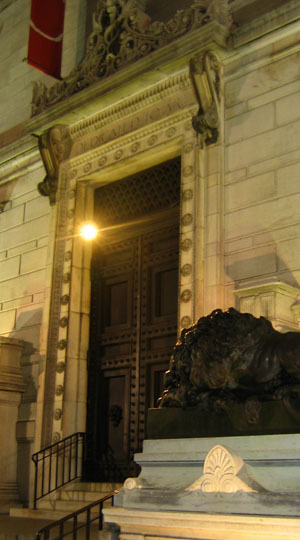 Located across the street from the White House, the Corcoran began when William Corcoran bequeathed his collection of contemporary American art. Contemporary as in the 19th Century. The museum continues this tradition of amassing works by artists of the times rather than historical works, giving aspiring artists the opportunity to be viewed in a major museum. Be sure to have lunch at the Muse Cafe, where seasonal ingredients sourced from the FreshFarm Market are used to create a number of simple lunch items, like soups, sandwiches and salads. The Dumbarton House is a beautifully designed federal house in the heart of Georgetown, completed in 1800. The house was owned by Joseph Nourse, the first Register of the US Treasury. A few years later, Charles Carroll would buy the house. During the War of 1812, Carroll would become known for escorting Dolly Madison from the White House, ahead of the advancing British army, and waiting for her as she ran back to rescue the portrait of George Washington. Visiting the Dumbarton House is by self guided tour, though guided tours are available by appointment. The house showcases the furnishings and lifestyles of Washington society at the time it became our nation's capital. Tucked in the northern reaches of Georgetown, Dumbarton Oaks is a 19th Century mansion named after a Scottish castle. The house is renowned for its collection of period furniture, Byzantine and Pre-Columbian American art. Mildred and Robert Woods Bliss started these collections, which were extended after they were donated to Harvard University. However, the exterior 16 acre terraced gardens are the true treasure. The gardens were designed in the early twenties by Mildred Bliss (the owner) and Beatrix Farrand (the landscape architect). Nineteen pools and fountains are flanked by flowering cherry, dogwood and crab apple trees, creating a nice respite from the hot DC summers. 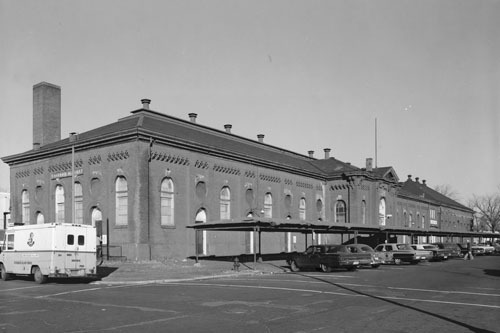 The Eastern Market, at the corner of North Carolina Avenue and 7th Street, has been a local favorite since 1873. From Tuesday through Sunday, DC area vendors sell fresh flowers, produce and fish. Arts and craft vendors are also plentiful and add to the variety. Those in the know make their way towards The Market Lunch in the eastern portion of the Market. Blueberry pancakes and crab cake sandwiches are among the favorites offered here. From the tense drama of Hamlet, to the tragedy of the star crossed lovers in Romeo and Juliet to the bawdiness of The Taming of the Shrew, the Folger Shakespeare Library can fill your need for a Bard fix. The Library, located across the street from the Library of Congress, has the world's largest collection of the works of William Shakespeare, including his First Folio and early quartos. 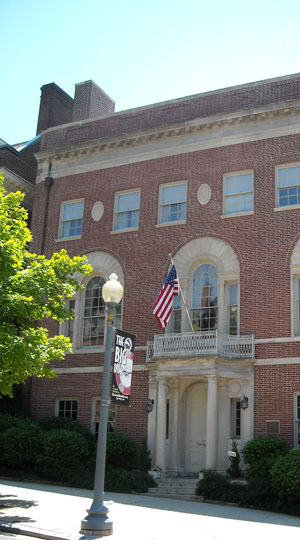 The Folger Library also serves literary scholars, holding one of the largest collection of works about Shakespeare, including papers written by Mark Twain, Walt Whitman and Queen Elizabeth I. "All the world's a stage" Shakespeare once proclaimed. Therefore a Shakespeare Library is not complete without a performance space. The Folger recreates London's Globe Theater inside the library. There are usually three performances a year, two by the Bard and another classic such as Cyrano. Ford’s Theatre will forever be linked to one of the darkest days in American history: the assassination of Abraham Lincoln by John Wilkes Booth. The theatre has been renovated to its 1865 appearance and today has a full schedule of shows on its schedule. The President’s box, where Lincoln sat, remains decorated in his honor. Ranger led tours are available free of charge and provide a fascinating insight to the times and events leading up to the assassination. Booth, an actor who once performed in the very play Lincoln was watching, knew the exact line to pull the trigger, waiting for the audience's laughter to muffle the sound of the gunshot. However, his ego prevented him from sneaking away. He jumped onto the stage to take a bow, severly fracturing his leg in the process. A small museum in the lobby houses the pistol used by Booth and the clothes Lincoln wore at the time of the assassination. The museum and theatre may be closed if they interfere with performances or rehearsals. Across the street is the Peterson house, where Lincoln eventually died the next morning. 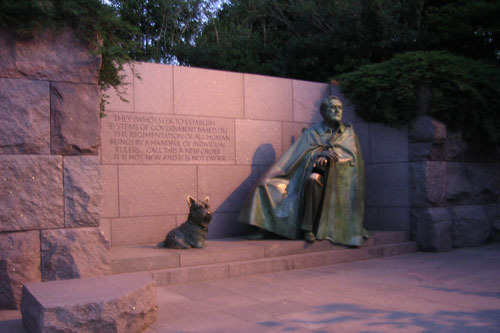 The Franklin Delano Roosevelt Memorial is one of the newer memorials in Washington. 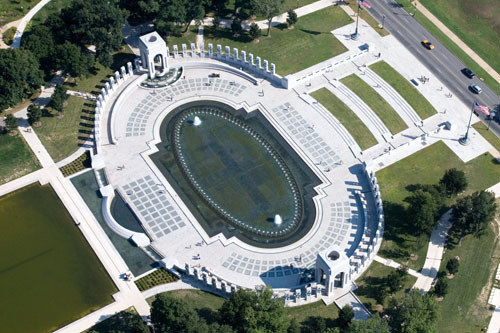 Built in 1997 and dedicated by President Bill Clinton, it is an open air memorial with four “galleries” representing the four Presidential terms served by FDR. The Memorial features dramatic cascades (no swimming allowed) of water; Hunger, a statue recalling the Depression by depicting the bread lines; reliefs of the fireside chats and FDR’s funeral procession. At the entrance of the Memorial is a statue of Roosevelt in a wheelchair. When the memorial opened, advocates for the disabled questioned why a there were no references to his condition. President Clinton answered by allocating additional funds for such a statue. The last home of abolitionist Frederick Douglass has been transformed into a museum and memorial by the National Park Services. He was a man born into slavery, who later fought tirelessly to end it. It is the first National Historic Site dedicated to the life and roles of African Americans. The home contains furnishings in Douglass' possesssion at the time of his death in 1895. Of particular note is the "glowery," a secluded room where Douglas did most of his writing. The Freer and Sackler Galleries house one of the finest collections of Asian Art in the world. Although housed in one building the Freer and Sackler are actually two museums, with the Sackler concentrating on Middle Eastern and Southeast Asian art while the Freer Gallery focuses on art from China and Japan, along with American landscape art. The galleries also host Asian films and musical performances. 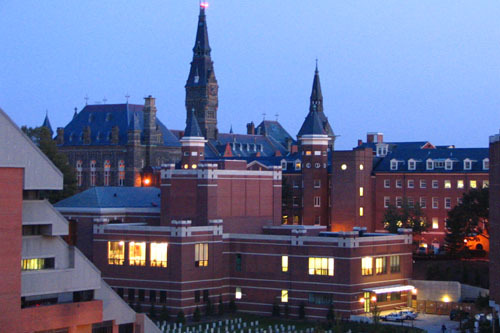 Perhaps the only American university with its own Imam, Georgetown, despite its strong Jesuit roots, fosters a truly international environment. The university attracts numerous important politicians from former Secretary of State Madeline Albright to former Spanish Prime Minister Jose Maria Aznar. 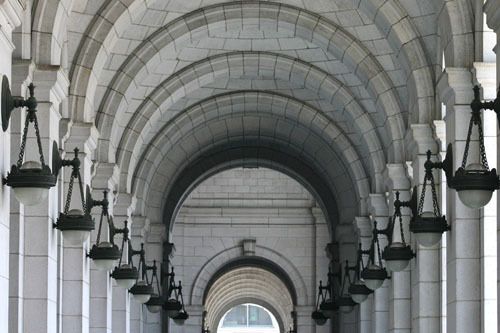 The buildings date back to the founding of the nation with numerous examples of federal style architecture. Enjoy the panoramic views of the capital and the Potomac river from several vantage points. The University itself reflects American history, as its school colors (blue and grey) represent the coming together of the nation after the destructive civil war (during which only 17 students attended the university). 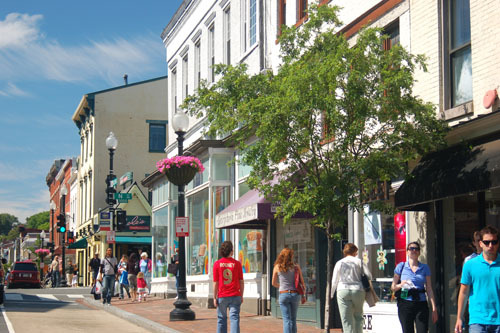 Take a stroll around the commercial district for a little retail therapy then stop at Georgetown Scoops for ice cream or one of the many fine international eateries for a bite. Amongst a plethora of museums along the National Mall, the Hirshhorn Museum and Sculpture Garden really stands out from the rest. Its round shape is distinctive from all of the rectangles and right angles of the Mall. Also , there is the wonderful sculpture garden outside located across Jefferson Street. 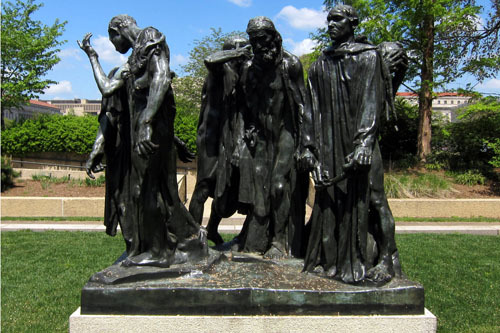 The outside sculpture garden includes the Wish Tree by Yoko Ono and one of the original casts of Auguste Roin's The Bughers of Calais. The Hirshhorn focuses on art created after World War II. Their collection includes the works of Henri Matisse, Pablo Picasso and Jackson Pollack. Adult Price: 21.95 $ (21.9 USD), Regular Adult (ages 12 - 64) admission. Youth Price: 14.95 $ (14.9 USD), ages 7-11. Children 6 and under admitted free. 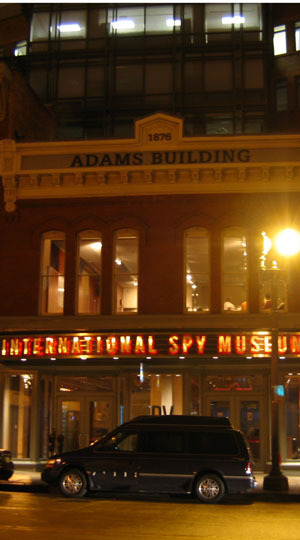 James Bond wannabes should make a bee line, discretely of course, to the new International Spy Museum. Interactive displays teach you the subtle art of surveillance, how to detect without being detected and spot suspicious activity. You can immerse yourself in the spy role by crawling through a faux-air conditioning duct work, and listen to conversations of those below you. The museum also has exhibits on the history of spying, which they call “the World’s Second Oldest Profession.” You can learn how George Washington relied on a New York spy ring to help his out manned army defeat the British. The identities of the people involved were so secret, they remained hidden until the 1930’s. Check out some of the Soviet’s spy gear, including a telephone embedded in a shoe. It makes you wonder if Maxwell Smart was spying on them, or vice versa. The hours of operation listed below indicate the last admission into the museum. The museum stays open for two hours after the last entry. After an overload of monuments, museums and corridors of government, sometimes, you need to get away from it all. Jack's Boathouse, on the banks of the Potomac River in Georgetown provides this escape, without leaving the city's borders. Since 1958, Jacks has been renting kayaks and canoes to weary tourists and visitors alike. Thanks to the relative calmness of the Potomac, novice kayakers and canoers will not have to battle any rapids or whitewater. However, please keep in mind this is a river and not a placid pond. Currents are constant and can easily carry weary riders downriver. Be sure to stay within your abiliites. 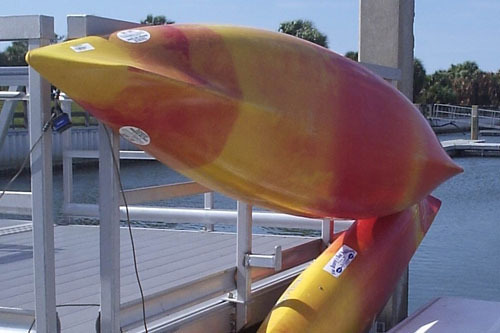 Lifejackets are provided and are mandatory, regardless of age or swimming ability. During the warmer weasther, Jacks Boathouse offers guided tours to and around Roosevelt Island. One of their special tours is the 90 minute twilight tour, where paddlers can watch the lights illuminate the monuments and buildings from a truly unique perspective. Jacks also operates a grill on the premises, knowing that you will be building up an appetite on the water. 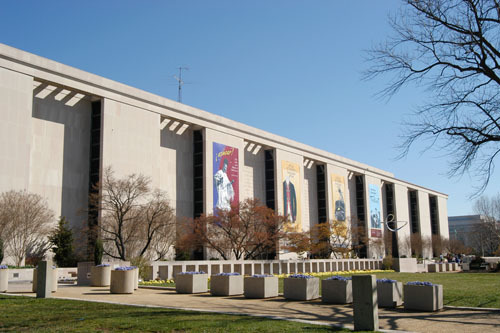 The Kennedy Center is one of the premier performing arts centers in the United States. It is the home of the National Symphony Orchestra, The Washington Ballet and the Washington National Opera. 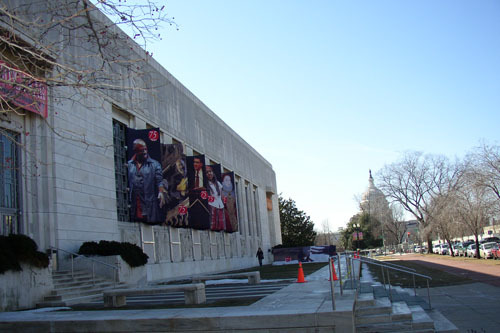 Touring Broadway plays and musicals usually find their way onto the Kennedy Center's stage. Although most Americans know of the Opera House Theatre, where the Kennedy Center Honors are held, the center is a complex of six performance arenas. Along with the Opera House, The Concert Hall showcases the biggest names in show business. The smaller Eisenhower Theatre hosts smaller musicals and dramatic plays, along with ballet and modern dance troupes. The 324 seat Family Theatre shows family oriented shows and serves as the educational outreach of the Center. The Terrace Thetre holds more intimate Chamber music and theatrical performances. Visitors can also attend a performance of Sheer Madness in the Theatre Lab. The play has been on the Kennedy Center stage for over 20 years, currently one of the longest running shows. For those who wish to visit the Center, but do not have the time to see a performance, the Center's lobby (hours displayed) is open for viewing. Also, depending on the schedule, guided tours are offered. Dedicated in 1995, the Korean War Memorial sits near the Lincoln Memorial, on the opposite end of the Reflecting Pool from the Vietnam Memorial. The memorial features 19 larger than life sculptures of infantrymen on patrol, carrying heavy backpacks crossing a field. The memorial demonstrates the ethnic diversity of the armed forces during the war, the first conflict to use an integrated armed force. The memorial is especially haunting a night as the sculptures are lit from underneath. The Library of Congress is not the first sight that comes to mind when planning a visit to Washington. Instead of dealing with the long and tedious lines for the tour of the Capitol Building, sneak over to this little treasure a mere city block away. Book and art lovers worldwide will be fascinated by the history and origins of this extensive and comprehensive collection of books in 362 languages. One of only three perfect vellum copies of the Gutenberg Bible is housed here. Every book or design that has been copyrighted resides in the building and serious scholars over the age of 18 can use one of the Library’s 22 reading rooms to research any and all publications, especially if they have the 45 minutes required to check out a book. Touring this building on your own is not as interesting as taking one of the many conducted tours that are given daily. Docents are knowledgeable and bring the building and its treasures to life. 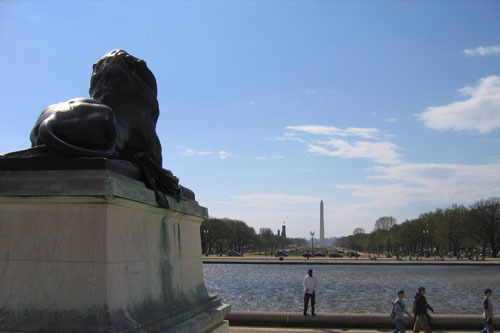 Looming over the reflecting pool, the Lincoln Memorial is one of the most awe-inspiring sites in DC. Designed to resemble the Parthenon in Greece, the Memorial is adorned with 36 Doric columns, representing the 36 states in the union during his presidency. The grandeur of the exterior pales in comparison to the magnificent, yet seemingly humble, 17-foot statue of the sitting Abraham Lincoln. The memorial is laid out so that the statue becomes visible slowly while visitors ascend the stairs. While most people are entranced by the statue, take the time to read the inscriptions on the wall. Taken from the Gettysburg Address and the Second Inaugural Address, it reminds readers of why Lincoln is often considered our greatest President. If you plan to take in more sights along the Mall, it is suggested to see the museums first, making your way west towards the monuments. The museums close around 5 PM while the Lincoln Memorial is open 24 hours. If you're short on time and would like to see other sights, the Vietnam Veterans Memorial and the Korean War Memorial are nearby. Daily music and a soul food menu are the reasons to visit this unpretentious blues bar in the Adams Morgan area of Washington. If you visit on non-profit Thursdays, know that $1 of every drink you purchase and 20% of food sales go to a designated charity every week. Most food establishments host an few events a year but Thursdays at Madam's Organ is a reason to check out the place while in town. By far, the Smithsonian’s Air and Space Museum is the most popular site in the city. In fact, it is the most visited museum in the world. The museum chronicles the history of flight, from the Wright Brothers at Kitty Hawk to the International Space Station and beyond. There are 22 exhibit rooms in the museum. The most interesting is the Milestones of Flight Gallery where aircraft are suspended from the ceilings by wires. Among the displays are Charles Lindbergh’s Spirit of St. Louis, John Glenn’s Mercury spacecraft Friendship 7 and Apollo 11 which carried the first people to the moon. 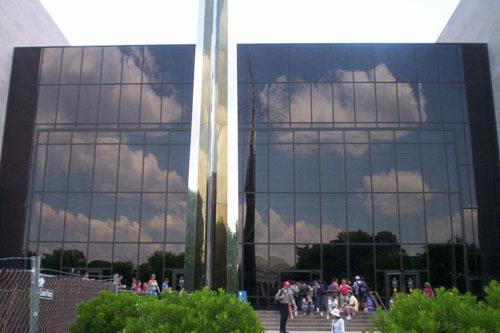 The museum also has the extremely popular IMAX theatre and planetarium. Unlike the museum which offers free admission, a fee is charged for IMAX admission. Tickets are very popular and sell out quickly. Open till 7.30pm during the Spring and Summer. The National Arboretum is a 446 acre green space in the northeast portion of the District of Columbia. It was established in 1927 and serves as a peaceful retreat from the hectic pace of the city. The Arboretum has several themed gardens including a Japanese garden that is home to the National Bonsai Museum. One ineresting grove has the state trees from all 50 states, from California's Giant Sequoia to Maine's Pine Tree. 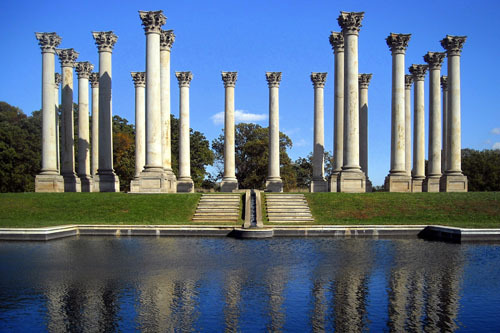 Be sure to look for the old National Capitol Columns. These 22 columns were in the original Capitol, but had to be removed during the 1958 renovation. Housed in the 1887 Pension Bureau Building, the National Building Museum dedicates itself to the world or architecture, design, engineering, constructon and urban planning. One of the highlights of the museum is the building itself. Upon entering, visitors are usually amazed at the five story atrium with it's tall Corinthian columns and vaulted windows. The exhibits at the museum focus on the different phases of the construction world, from the evoution of urban planning, suburban sprawl and the development of green buildings. Children are especially drawn to LEGO architecture. Designers have built 15 buildings from LEGO bricks including the Empire State Building, St Louis' Gateway Arch and the Sears Tower. 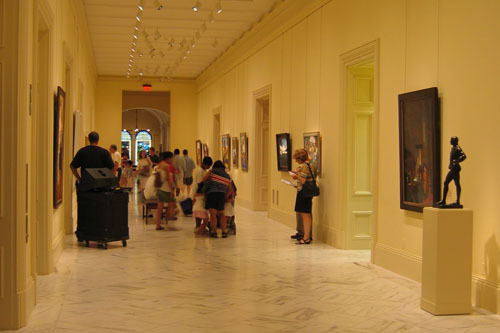 The National Gallery of Art houses one of the most impressive collections of Western art. Like the Louvre in Paris or the Met in New York, it is nearly impossible to grasp the full scope of the collection in a short visit. Art lovers should plan to spend most of the day here. The museum is split in two: the West Building with its more classical architecture proudly displays works from the Middle Ages, through the Renaissance and up to the end of the 19th Century. Masters such as El Greco, Rubens and Degas are on display. Be sure to check out Dreyfus Madonna and Portrait of Ginevra de’ Benci, the only paintings by Leonardo Da Vinci displayed outside of Europe. The East Building was designed by I. M. Pei in 1978. It houses artists from the 20th Century to today. Picasso, Miro and Jackson Pollock are represented. A mobile designed by Alexander Calder fills a seven story atrium. For more than a century, the National Geographic, through a combination of poetic prose and exquisite photographs, has transported readers to far away places, or even shown their own city in a new light. Walking into the National Geographic Museum is like walking into the pages of the magazine. Rotating pemanent exhibits showcase the expeditions and cultural research from all over the world. Recent exhibits showed the struggles of two explorer teams as they raced towards the South Pole. The museum draws from its vast collection of photos and rotates the exibits often. Much like each issue of the magazine higlights something new and different, the same applies for each visit to the museum; visitors are likely to see something completely different. Bike and Roll offers bike rentals and bike tours in three locations in the DC area: at the Old Post Office, Union Station and in Alexandria, VA. 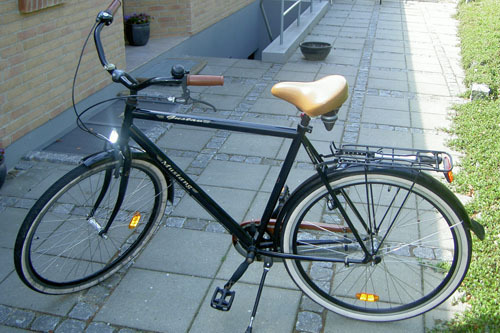 Rentals allow you to take the bike and tour on your own in this surprising bicycle friendly town. Conversely, you can sign up for one their scheduled tours that include the Capital Sites Tour, Monuments Tour (both offered during the day and night) and the Old Town Alexandria Tour. Tours in Washington are flat with minor inclines. Both Washington tours are about 3 hours long and travel on level surfaces. Note, the Capital tour is 7 to 8 miles while the Monument Tour clocks in at 3 to 4 miles. The Alexandria rides feature some hills and is rated "moderate." The tour is 7 to 8 miles and lasts 3 hours. There is no age limit for the DC tours but riders must be over 13 to tour Alexandria. For a self guided adventure, try the tour along the Mt Vernon Bike trail on the Virginia side of the Potomac. Riders travel 9 miles to George Washington's home, then return to Alexandria by boarding the Miss Christen narrated boat tour. In contrast to the pure entertainment value offered by the Spy Museum across the street, The Portrait Gallery is housed in the calming environment of a Greek revival building from the 1830’s. Originally the site of the US Patent Office, the building exudes the graciousness of the Gilded Age. The Portrait Gallery of US Presidents offers a fascinating tour of the country through the eyes of the men that have shaped its history and defining moments. A courtyard cafe in a beautiful atrium offers gourmet fare and a welcome respite for tired tourists from battling crowds and lines. At first thought, visiting a museum dedicated to United States Post Office may not invite the same enthusiasm as the Air and Space Museum. However, a visit is sure to exceed expectations. The museum traces the history of the United States as seen through its mail service. Special exhibits show the difficulties letter carriers faced in the post Revolutionary period; a journey from Boston to New York was an arduous trip through dense forests, where wild animals and bandits could strike at any moment. The museum also showcases the development of the Pony Express and technology that led to train and airmail. The museum also focuses on how the letter kept families in touch, whether around the block or across the seas. Especially poignent are the letters to and from service men and women, from the Revolution to Afganistan. Look for the letter that survived the Hindenburg explosion. The story is that it was found on the ground, picked up and delivered to its intended recepient, depite the burn marks on the paper. The National World War II Memorial is the newest memorial on the Mall, sitting between the Washington Monument and the Reflecting Pool. The oval shaped. 7 acre memorial is a tribute not only to the men and women who fought and died in the war, but to those who sacrificed on the home front and to the Rosie the Riveters who helped with the war effort. 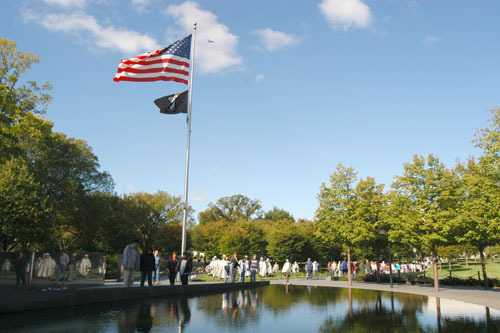 The memorial consists of 57 pillars, representing the American states and territories involved in the war. It surrounds a Rainbow Pool with fountains. Twenty four bas relief panels represent significant scenes from the Pacific and European Theaters. Beyond the center of the Rainbow pool are 4000 gold stars, representing 100 American soldiers killed for every one star. The National Zoological Park is home to over 2400 animals covering over 400 species. But everyone wants to see just one specie: the giant pandas. Named Tian Tian and Mei Xiang, they have become big stars in Washington. The birth of their cub Tai Shan in 2005 knocked politics off the front page. Other than the pandas, there is much to see at the zoo. Another highlight is Amazonia, a replication of a South American rain forest. 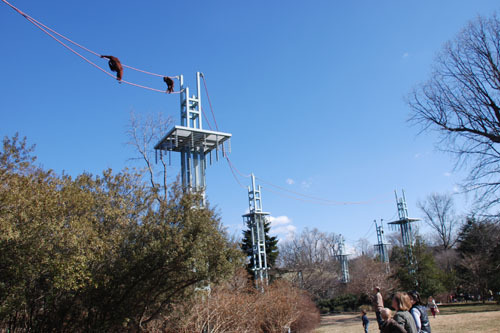 At 10 AM and at 2 PM watch orangutans swing on cables over head. Children will enjoy the Kids Farm, where they can get up close and personal with ducks, chickens, cows and other farm animals. Roam around and you’ll see great exhibits of cheetahs, elephants, tigers and a host of other animals. But we know its all about the pandas. Youth Price: 13.95 $ (13.9 USD), 7-12 years. 6 and under free. 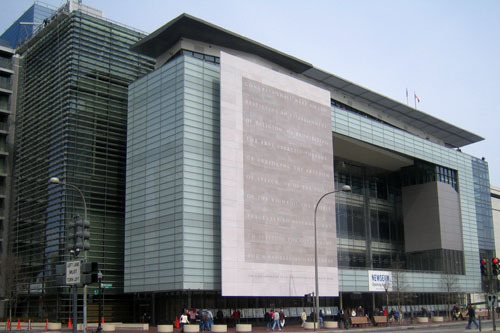 The country’s largest museum dedicated to five centuries of world news, the Newseum moved to an expanded high-tech facility in late 2007. Newscasts, documentaries and multiple interactive exhibits keep even the youngest visitors engaged. The interactive newsroom is a big hit and all ages will enjoy the award winning photography and journalism exhibits. In the museum’s main theater, treat yourself to a 4-D experience including seat shaking and other special effects. Built in 1899 the 12 story Post Office Building was Washington’s first skyscraper. Housing the Post Office until 1934, it was slated for demolition several times. Finally, preservation advocates put a final stop to the wrecking ball in the 1960’s. Today, it is a popular place with the locals and visitors for dining and shopping. 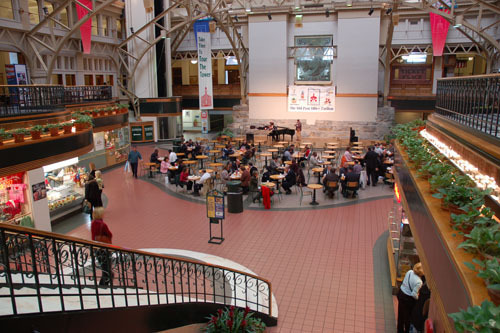 The open atrium with the glass ceiling is appealing and the variety of good, affordable restaurants in the food court draws a huge lunch time crowd. On most summer days, you can enjoy a free music performance on the atrium's stage. The highlight of the Post Office Building is the observation deck on the 12th floor (hours displayed). Though only half as tall as the Washington Monument, the Post Office offers a better view of Pennsylvania Avenue with the Capitol at the end. Many people prefer this view because you can see the Washington Monument. 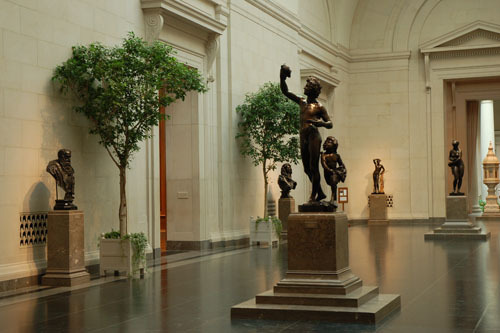 The Phillips Collection was the first art museum in America to focus on modern art. The museum was started, and named, for Duncan Phillips, the grandson of steel magnate James Laughlin. Phillips put his personal collection on display in Washington DC. As his collection grew, the demand from the public also grew. He eventually turned their private residence into a museum in 1930. The collection focuses on late 19th and early 20th Century artists. Among the masters represented are Vincent Van Gogh, Claude Monet, Edgar Degas and Pablo Picasso. The museum's masterpiece is Renoir's Luncheon of the Boating party (1881). 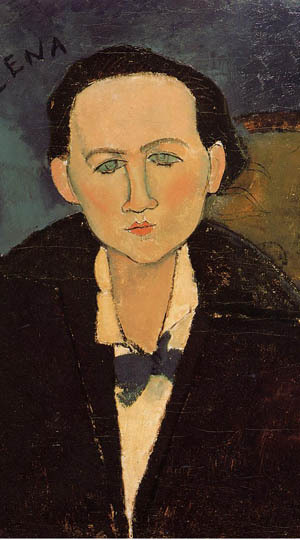 The Phillips Collection is active in art education. Throughout the year, there are lectures and conversations with various artists. The Phillips is also known for their musical concerts. On Sunday afternoon, classical chamber music is heard in the music room. On the first Thursday of the month, the Phillips Collection stays open late. ThenPhillips After 5 program features live jazz, gallery talks and a cash bar. 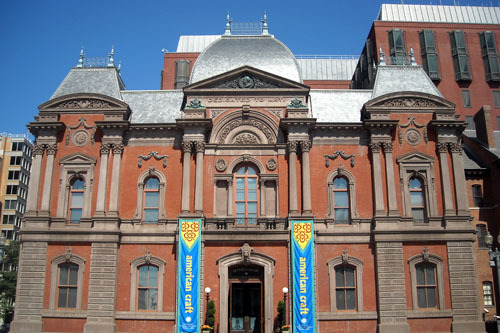 The Smithsonian's Renwick Gallery is the close cousin of the American Art Museum. While the American Art Museum focuses on paintings and sculpture, the Renwick features American crafts and decorative arts from the 19th to 21st Centuries. Housed in a historic French Second Empire style home, the Renwick is just steps away from the White House. The museum houses unique pieces from the American decorative arts movement. Highlights include Game Fish by Larry Fuente, Ghost Clock by Wendell Castle and Bancketje by Beth Lipman. At 1800 acres, it is hard to call Rock Creek Park a hidden treasure. Located in the northwest corner of the District of Columbia, away from the national mall, the park is a place where locals can escape the onslaught of tour buses. 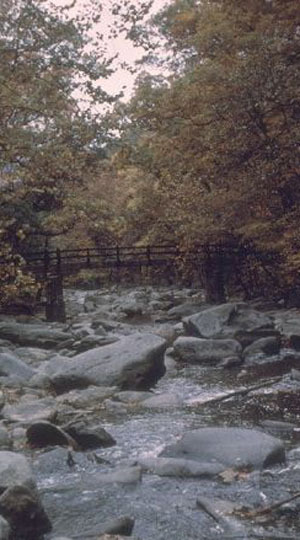 Unlike other urban parks, whose grounds were designed by landscape architects, Rock Creek Park was purchased by Congress in 1890 to preserve the valleys, ravines, old growth forests and fields from further development. The park has extensive trails for walking, hiking, jogging, biking and horseback riding. Tennis courts and an 18 hole golf course available for the public. Like most urban parks, Rock Creek Park has been the site of criminal activities. It is best to avoid the park at night and do not travel alone, especially if you are unfamiliar with your surroundings. 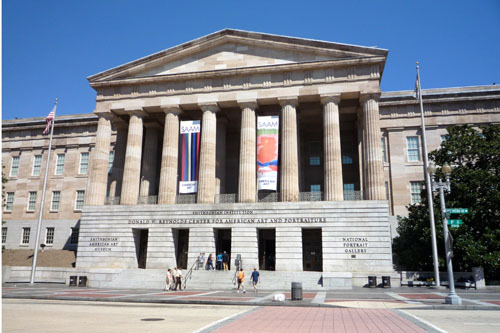 Sharing a building with the National Portrait Gallery, The Smithsonian Museum of American Art features, as its name would imply, American artists and their works. Works dating from Colonial times to the present day are represented here..
More than an art museum, this is a window into American history and culture. 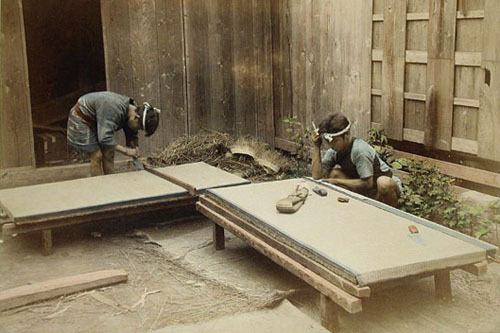 Displays include works from the Guilded age and the Works Project America (WPA). Furniture from colonial New England cabinetmakers to the Jetson-like mid 20th Century is also on display. Artists Winslow Homer, Georgia O'Keefe and Edward Hopper are prominent in the displays. 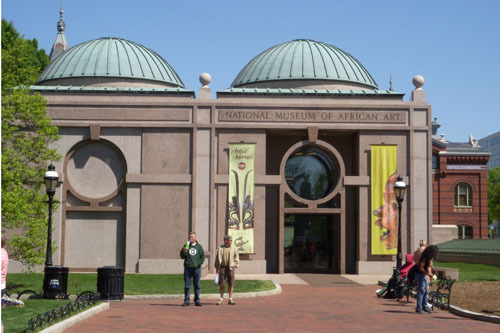 The Smithsonian Museum of African art offers the largest collection of Sub-Saharan African art in the US. The museum started in 1963 in the former home of abolitionist Frederick Douglas. The Smithsonian assumed leadership of the museum in 1979. 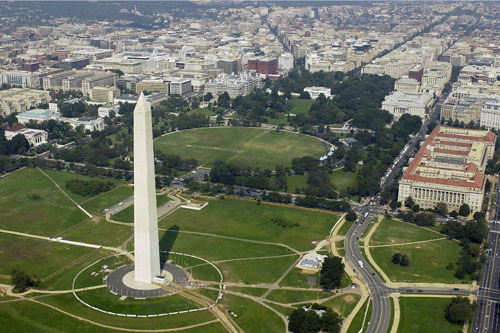 In 1987, it was moved to a prominent spot on the National Mall, next to the Smithsonian Castle. The collection ranges from traditional masks and sculptures to more modern mixed media work of African artists. The museum hosts gallery talks with current artists who engage in a dialogue about their work. Children are also invited to create their own artwork in the Playtime! area. Kids can design their own masks and paintings. When one thinks of the Smithsonian and its voluminous artifacts, this is the museum that comes to mind. “America’s attic,” as it is known, has one of the most varied collections of any museum in the world. 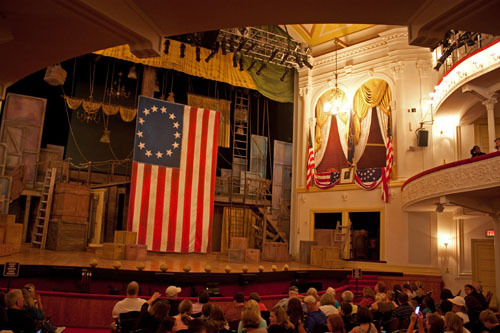 Where else can the original Star Spangled Banner, the flag that inspired Francis Scott Key to write the National Anthem be displayed under the same roof as George Washington’s teeth, Dorothy’s ruby red shoes from the Wizard of Oz and Fonzie’s leather jacket from Happy Days. Displays are ever changing, but always focus on American history and culture, its highs and lows. While walking through and examining all of the artifacts, just remember this: the museum displays only 2% of its holdings at any one time. Walking into the front door of the American Museum of Natural History, visitors are greeted by a huge African bush elephant. Though he’s stuffed, he looks like he is ready to walk off his pedestal and out the front door. Perhaps he wants to tell Congress a thing or two. While awe-inspiring, the elephant is just one of the many treasures awaiting you on three floors of displays. Without a doubt, you will want to look at the many dinosaur skeletons on display. 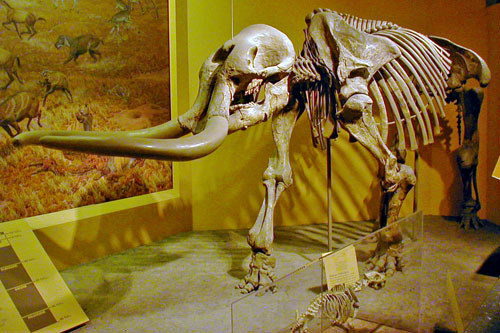 Equally as good, the Hall of Mammals has over 300 artifacts, several of the taxidermy artifacts were felled by President Theodore Roosevelt. Visitors should not miss the Hall of Geology, Gems and Minerals. More than just a collection of rocks, the Hall contains the 45 carat Hope Diamond, once the possession of Marie Antoinette, and said to be the largest diamond on earth. Other displays include a 336 stone diamond necklace, believed to have been worn by the Spanish Royal family. 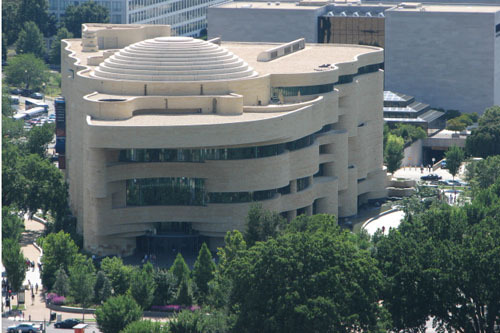 Opened in 2004, the National Museum of the American Indian is one of the newest museums to open on the Mall. The exterior of the five story building is done in curving sand colored limestone to invoke the rock formations that have been shaped by thousands of years of wind and water erosion. Inside the museum, visitors walk into the Potomac rotunda, which serves as a stage for performances and demonstrations. It is decorated with celestial markings invoking the Native calendar with the solstice and equinoxes. Several exhibits, such as Our Peoples: Giving Voice to Our Histories use interactive displays and artifacts to show Native American history and culture. The museum also provides space for contemporary Native American artists. The Supreme Court is the highest court in the land. 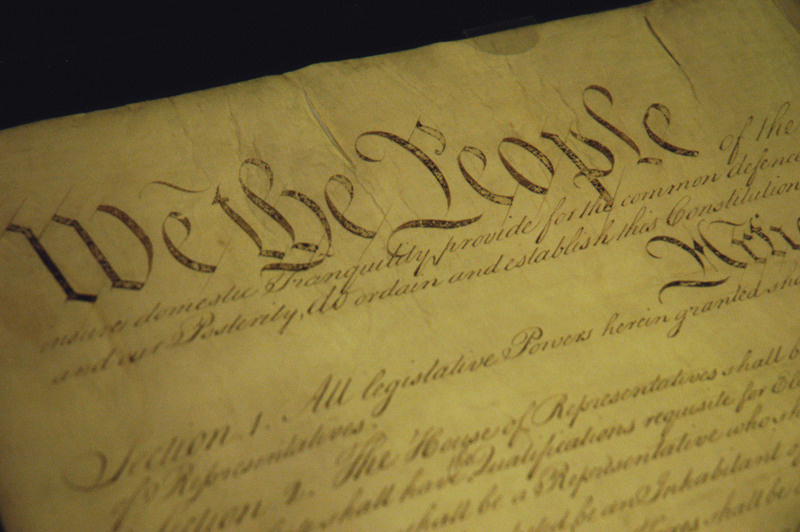 Along with the legislative and executive branch, it forms one of the three equal branches of the Federal Government. Decisions by the Supreme Court have altered the course of American history. In 1950, Brown vs Board of Education determined that separate but equal is not Constitutional. In Miranda v Arizona, the Court ruled a suspect must be read his rights, providing plenty of material for crime drama screenwriters. The Supreme Court moved into their current building in 1935. Before then, arguments were heard in the basement of the Capitol. . The Supreme Court can be visited by a self guided walking tour. The court room is on the ground floor of the building. Trained docents host 30 minute talks, detailing the history and architecture of the Court. 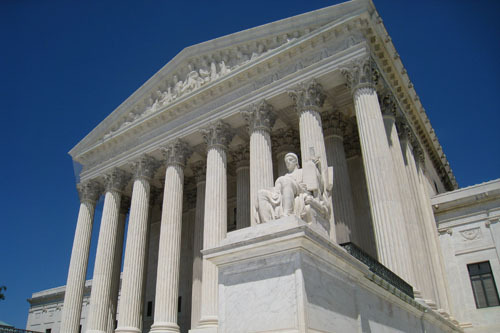 The Supreme Court allows the public to view Oral Arguments and see the Court in action. Public viewing is on a first come first served basis. The Court's session usually runs from October through April, with arguments heard on Mondays, Tuesdays and Wednesdays. Within the Rotunda of the National Archives are the most important documents in American history: the Declaration of Independence, the United States Constitution and the Bill of Rights. These are the original documents, displayed in air tight and temperature controlled cases. Beyond the Rotunda are public exhibits related to the archives. While the Archives became a popular destination following the movie National Treasure, there is no display featuring Nicholas Cage. Instead, the museum documents how the government stores the documents and stories behind them. The documents displayed range from historic, such as treaties and signed alliances, to mundane yet no les historic such as aerial photos of Disneyland when it first opened. If you are visiting during the summer, and plan to see the other museums, save the Archives for last as it is usually open later than the Smithsonian museums. 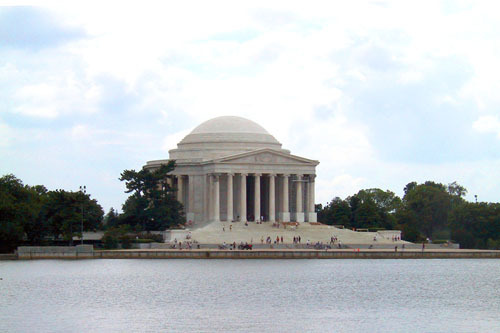 Walk the length of the Mall from the Capitol Building to the Jefferson Memorial. There’s no better way to get a good feeling for the history of this Capitol City. A patriotic zeal engulfs most Americans as they stroll the length of the mall. If you walk to the Washington Monument, you can see the Capitol building, the White House and the Lincoln Monument from one vantage point. A feeling of well-being overtakes visitors who are eclipsed by huge monuments and large scale buildings housing the art and science of human imagination and prowess, leaving them with a sense of wonder in the achievements of mankind. A beautiful day is an added plus, and even the throngs of visitors are readily absorbed by the wide, tree lined streets. The Shops at Georgetown Park is one of the largest indoor shopping malls in Washington. The Mall sits at the corner of M Street and Wisconsin Avenue, the main intersection of Georgetown. The decor of the common area is all geared towards upscale shopping. However, do not expect anything unique here. The Mall is home to the typical shops found in malls across the country: H&M, Express, Sunglass Hut and J. Crew. 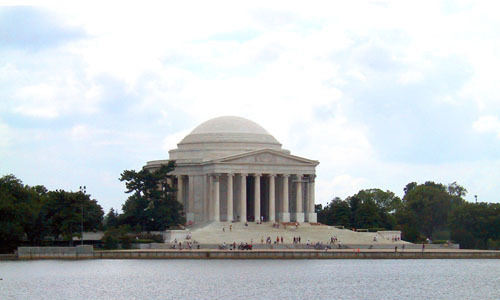 Located south of the mall and along the southeast bank of the Tidal Basin, the Thomas Jefferson Memorial honors the man who wrote the Declaration of Independence, served as Secretary of State under George Washington, Vice President under John Adams and as third President of the United States. Inside the rotunda is a 19 foot statue of Jefferson standing on a six foot pedestal. Carved in stone are the inspiring words he wrote. 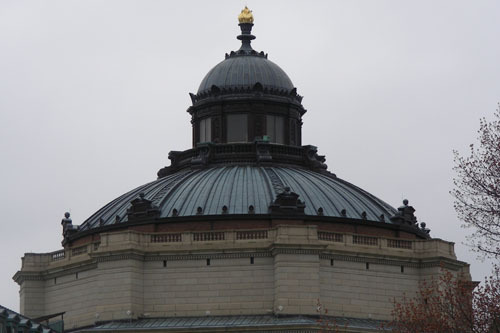 The memorial is built to resemble the pantheon in Rome, a favorite architectural style of Jefferson. This is the same style he used when designing his home, Monticello and the original buildings of the University of Virginia campus. If you are arriving during cherry blossom season, this is the best place to be in the city as most of the trees ring the Tidal Basin. Union Station is a reminder of the golden days of railroad travel. Completed in 1908, its vaulted ceilings in the main waiting area, designed in the beaux artes fashion, recall an era when trains were the tranport of choice. Today, Union Station serves as the main commuter hub, with connections to the Maryland and Virginia suburbs, Amtrak and the Washington Metro. Over 32 million people pass through Union Station every year. In the 1980s, Union Station underwent an extensive rennovation. A food court was added to the basement area, serving world cuisines. In the waiting area, upscale dining has expanded. The station also added an upscale shopping mall with over 70 stores including Victoria Secret, Bath and Body Works and Swarovski Crystal. Tucked into a small corner near the Capitol, the US Botanical Gardens offers a respite from the harsh realities of the world that are, literally, steps outside its gate. The idea of a National Botanic Garden is as old as the city. Presidents Thomas Jefferson and James Monroe suggested the Gardens, then a swampy area on the Mall. Following the Civil War, Congress approved the funds to build the greenhouses. 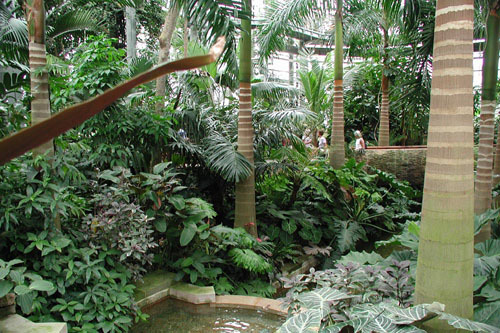 The Conservatory houses over 10,000 specimens of plants from all over the world. Thanks to the warmth of the greenhouse, there is always something in bloom, regardless of the weather outside. One of the highlights is the rain forest, where visitors can see the plants and trees from above, providing a unique perspective. The United States Capitol is the seat of the Legislative Branch of the US government. The building and site were purposely chosen to be above the White House. This would prove that the people, through their elected representatives, were more powerful than the President, who lived in a "humble" house down the street. Visiting the Capitol became much easier in 2008 with the opening of the Capitol Visitors Center, located below ground level, east of the main building. Security is more streamlined and the area provides a location for visitors to reserve their tour or pick up their reserved tickets. A food court and restroom facilities are on the premises. The Visitors' Center is also decorated with official statues offered to the Capitol by the 5 states. Seeing the Capitol is by guided tour only. Visitors are first brought into a theatre to watch a 13 minute movie called "Out of Many, One," telling the history of Congress and highlighting the historic laws that have helped shape the country. Following the movie, tours will lead the Crypt of the Capitol, the Rotunda and National Statuary Hall. Advanced reservations are recommended, but not necessary to take a tour. Except during the high tourist season (Cherry Blossom time, summer vacation), walk up guests can be accommodated with little to no wait. US citizens can contact their Congressional members to get a more in depth tour from a Senator or Representative staff member. The public is also permitted to watch Congress in session. US citizens can obtain gallery passes from the Congress member's office. 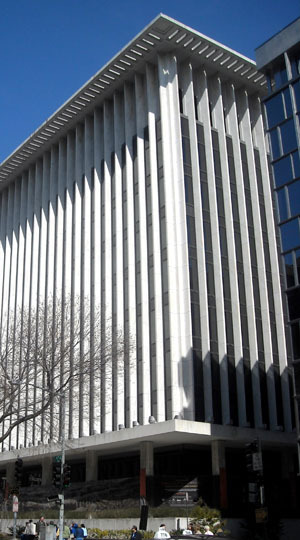 Foreign citizens can contact their country's embassy in Washington. 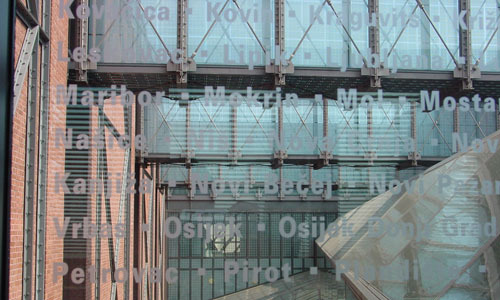 The Holocaust Memorial remembers the 6 million Jews and other victims of Nazi prosecution during World War II. The museum is chilling, powerful and purposefully disturbing. It was designed to invoke a concentration camp, with exposed beams, dim lighting and gray walls. Unlike the other museums and monuments on the Mall, the Holocaust Memorial is reverently silent. The exhibits are in three stages. The first represents Jewish life before the Nazis came to power. The second shows the rise of the Nazi Party and the anti-Semitic policies that became the law of the land. The third honors the Allied soldiers who liberated the camps and the survivors while honoring those who perished. This is not a light hearted exhibit. The purpose is to remind visitors of the brutality of the Nazi regime. The museum is not recommended for children under 11. For those slightly older, the museum offers a recorded tour, offered from the view of a child in the camps. In 1997, the NHL Washington Capitals and NBA Washington Bullets (now Washington Wizards) moved from the suburban Maryland location into the Verizon Center, a 20,000+ seat arena right in the heart of the city's Chinatown. 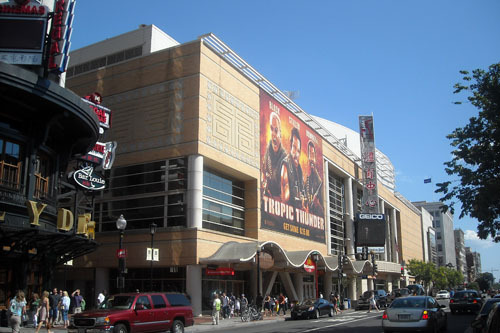 Despite the controversy of placing a major arena in an ethnic enclave, The Verizon Center proved to be a success. Along wth the Capitals and Wizards, the Verizon Center also hosts the WNBA Washington Mystics and Big Eat college basketball Georgetown Hoyas. The Center also hosts many concerts and shows through out the year. Past performers have included Lady Gaga and many political showcases. You cannot miss the Washington Monument. Standing at 555 feet and 5/8 inches high, it can be seen from anywhere in the city. It was built in honor of George Washington, who led the country to independence, and then became its first President. While the view from the ground is impressive, be sure to make your way to the top. On a clear day, visibility can reach 30 to 40 miles. Even if the skies are less than clear, especially on a typical hot muggy summer day, the birds eye view of the White House, Capitol and the surrounding monuments is astounding. Admission to the Monument is free, but requires a timed ticket. The tickets are distributed at a kiosk on 15th Street starting at 8:30 AM. Tickets are on a first come - first served basis. One person can pick up a maximum of six tickets. Everyone, regardless of age, needs a ticket to enter the Monument. 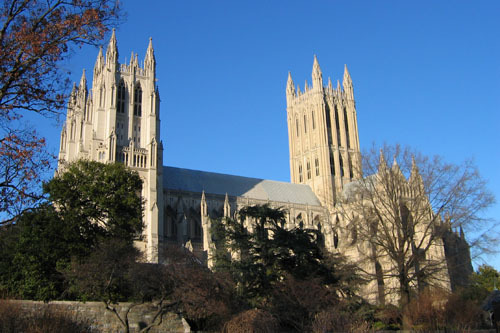 The Washington National Cathedral has become the religious center of the country. The cathedral has hosted services for national prayer events and funerals for deceased Presidents and members of Congress. Construction of the Cathedral began in 1907. Although services have been held for many decades, the church was not officially completed until 1990. Built in the neo-Gothic style, the cathedral contains several modern and non-religious features. These include a stained glass window with a moon rock and a gargoyle designed to look like Darth Vader. The Cathedral conducts daily tours when the church is not in use. Visitors are also permitted to tour the Cathedral on their own, including a visit to the tower. Vistors are reminded that this is a church and asked to be respect the space. 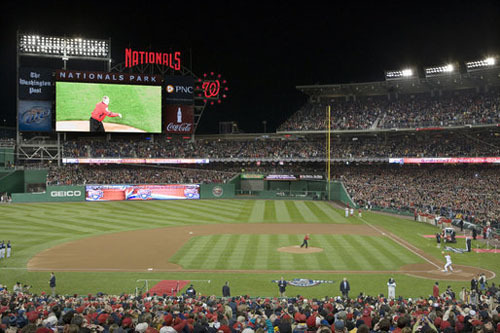 In 2005, baseball returned to the Nation's Capital after a 34 year absence when the Montreal Expos left Canada and became the Washington Nationals. Upon their arrival, the Nationals played at RFK Stadium, the former home of baseball's Washington Senators, before they moved in 1971 and became the Texas Rangers. In 2008, the Nationals moved into their state of the art stadium near the Anacosta River Waterfront. Despite the move, the team has not had success on the field. Since coming to Washington, the Nationals have placed last in the National League East five out of their first six seasons. Fortunes appear to be turning around with the acquisition of younger talent, led by pitcher Stephen Strasburg, mixed with veteran players. One highlight of a Nationals game is the President's race, where caricatures of George Washington, Thomas Jefferson, Abraham Lincoln and Teddy Roosevelt race around the ball park. You don't see that every day. The White House is the seat of the executive branch of the US government. Not merely the home of the President, the White House is the office and nerve center of the policies that shape America and the world. For most of its history, the White House had an open door policy. However, during the Civil War, security began getting tighter. Going into the 20th Century, the public saw less and less of the White House. After the Oklahoma City bombings in 1995, vehicular access to Pennsylvania Avenue ceased. Following the September 11 attacks, the White House stopped all tours until 2003 when they resumed under new rules. Today, those wishing to visit the White House can only do so through their member of Congress, either Representative or Senator. Requests must be made no earlier than 6 months in advance and no less than 21 days before the visit. The Secret Service completes background checks on all who request tour tickets. Foreign citizens should make their request through their country's embassy in Washington. The tours are self guided. 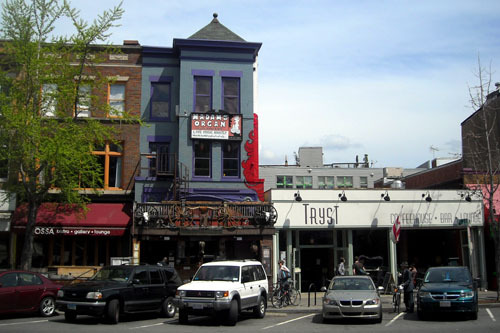 Wisconsin Avenue and M Street is the main intersection in the Georgetown area and both streets serve as the commercial center. While M Street is chock full of national chain stores (the same you see at home), Wisconsin Avenue concentrates on unique, original boutiques. French and Italian home goods are found at Amano (877 Wisconsin) while rooms with a View is a classic fine stationery store. Naturally women’s fashions are well represented. Check out Sugar (1633 Wisconsin) and Urban Chic (1626 Wisconsin). After all that walking and shopping, duck into Patisere Poupon for a quick bite and nourishment for the next round of shopping. 43 of 44 Presidents have lived in the White House. Yet, only one, Woodrow Wilson, decided to remain in Washington after their time in office ended. Wilson bought his house as his Presidency was winding down and moved in soon after his successor, Warren G Harding, took the oath as President. Wilson would spend the last three years of his life in this house on S Street, eventually passing away in his bedroom. Following his death, Wilson's widow Edith, lived in the house until her death in 1961. The house was donated to the National Trust for Historic Preservation to run as a museum. Tours of the Wilson home are offered throughout the year. The home remains furnished with the Wilsons' original possessions including a mosaic of St Peter, presented to Wilson by Pope Benedict XV. If youâ€™ve already seen Washington DCâ€™s major sites, take this tour to explore off the beaten path. Visit local spots that first-time visitors normally donâ€™t see, including Eastern Market, the Waterfront areas, and the Navy Yard. Youâ€™ll travel aboard a unique, all-electric eCruiser vehicle, letting you cover more ground in a fraction of the time. Youâ€™ll also take some brief walks and learn some local history from your guide. Each electric cart seats five people. This small-group tour is limited to 12 people, ensuring a more personalized experience. Departing from the Easter Market Metro at 1pm, hop aboard your special battery-operated electric cart and begin your off-the-beaten-path tour of Washington DC. This unique mode of transport lets you sit back and relax as you whiz through areas and neighborhoods that first-time visitors usually donâ€™t see. Each electric cart seats five people, so you'll enjoy a small-group experience. Your guide will take you to local hotspots along the Waterfront areas, across the Congressional Cemetery, and along Eastern Market, all while telling stories and sharing local history to give you a glimpse into local life. You'll also catch views of the resting grounds of J Edgar Hoover, historic Washington Navy Yard, and sample food at one of the oldest fresh food public markets, before returning to the original departure point to conclude your tour. Reston Limousine offers a luxurious tour by a private driver and limousine, stopping at the major sites in the Washington area. The tour stops at the Iwo Jima Memorial, Lincoln Memorial, Vietnam Veterans Memorial, FDR Memorial and the Jefferson Memorial. The tour will pass other major sites including the Capitol, White House and the Supreme Court. The driver is also your tour guide, providing historical and “behind the scenes” commentary about the nation’s capital. 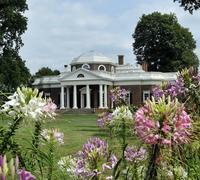 Travel from Washington DC to Charlottesville, Virginia, to explore Monticello, the home of President Thomas Jefferson. On this full-day tour, learn all about Jefferson's professional accomplishments and personal life as you tour Monticello, including Mulberry Row â€” where some of the slaves who worked on the plantation lived. 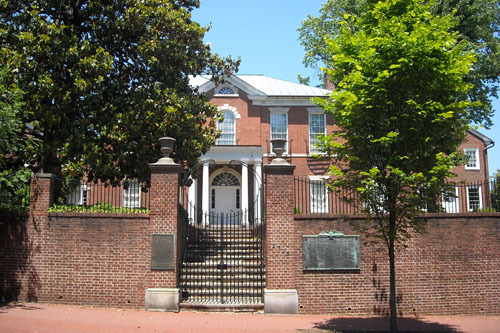 Also, drive by the University of Virginia, which was founded and designed by Jefferson. This highly informative tour provides a detailed look at the impact of America's third president. At Washington DC's Union Station, board your comfortable, air-conditioned coach for the 117-mile (188-km) drive to Charlottesville, Virginia. Along the way, listen to your driver talk about the life of Thomas Jefferson, and watch a video on this founding father and American president. Stop at Michie Tavern for a tour of this rustic, 18th-century landmark and a hearty lunch of southern favorites (own expense) served family style; you may also choose to wait and eat at the cafe at Monticello if you prefer. After leaving Michie Tavern, take a gorgeous drive up an 850-foot (260-meter) mountain to Monticello, Jefferson's lavish plantation home, and spend 3 to 4 hours exploring it on your own. 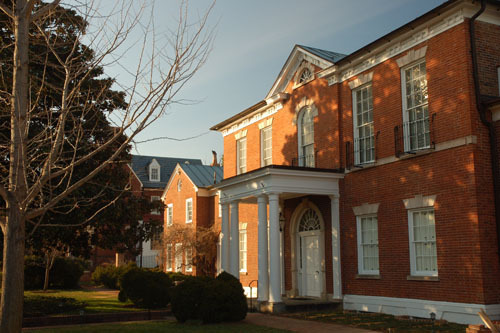 Join a guided tour of the magnificent neoclassical-style mansion, and see the extensive slave quarters on Mulberry Row. Walk around the lush vegetable and flower gardens and pay a visit to Jefferson's grave. Your day trip also includes a drive through the lovely grounds of the University of Virginia, which was founded and designed by Jefferson. Relax on the drive back to Washington DC, and conclude your 11.5-hour day trip at Union Station. 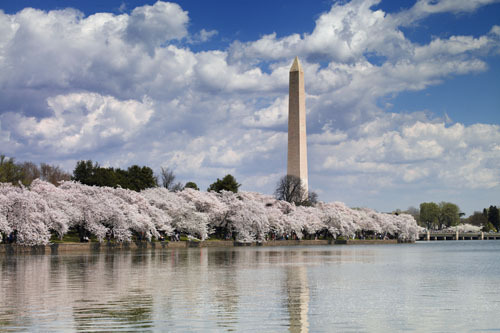 Witness the wondrous spectacle of Washington DC's famous cherry blossom trees in full bloom on this weekend cruise on the Potomac River. See top DC attractions including the Lincoln Memorial, Jefferson Memorial, Vietnam Veterans Memorial and Washington Monument as you listen to historical facts and anecdotes about the city on your 50-minute narrated cruise. Capture amazing photos of the delicate pink cherry blossoms framing some of DC's best-known landmarks. With multiple departure times, it's easy to fit this scenic cruise into your springtime visit to America's capital city. Board your comfortable, heated boat in the Georgetown area of Washington DC to begin your cherry blossom cruise. For just two weeks a year, Washington DC's delightful cherry blossom trees – a gift from the city of Tokyo – drape the city in lovely shades of pink and white. 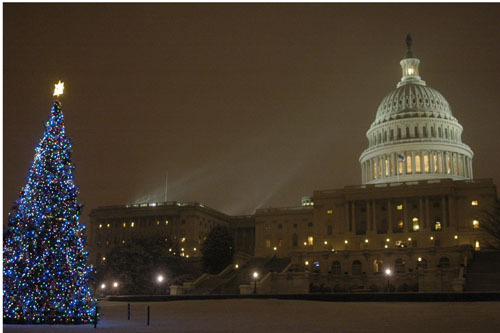 This magical time affords some of the most spectacular photo ops of the nation's capital. Set off along the Potomac River for a closer look at these flowering trees in all their majesty. Feel free to roam about your double-decker boat, which has both lower-level indoor seating areas with panoramic windows and an open-top upper deck. Relax as you admire cherry blossoms reflected in the river, fluttering in the breeze and framing famous monuments and memorials. Beverages are available for purchase. 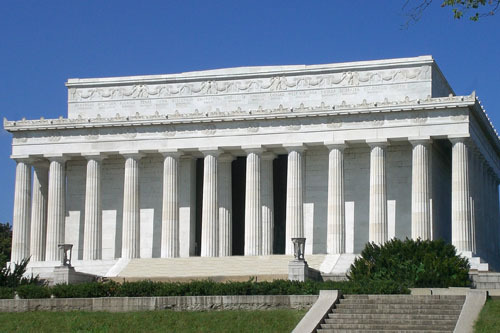 Listen to live commentary about the history of Washington DC and the National Cherry Blossom Festival and the many landmarks along your route including the Lincoln Memorial, Jefferson Memorial, Washington Monument and John F Kennedy Center for the Performing Arts. Your enchanting 50-minute morning or afternoon cherry blossom cruise concludes where it began in the Georgetown area of Washington DC. Witness the site of the largest battle ever fought on US soil on this day trip from Washington DC to Gettysburg, Pennsylvania. Relax on a picturesque drive through the Maryland and Pennsylvania countryside. Learn all about the Battle of Gettysburg through a show featuring narration and a detailed miniature military diorama, and visit Cemetery Ridge â€” where President Lincoln delivered his historic Gettysburg Address. Get insights into the civilian experience of the bloody battle by visiting the restored home of George Washington Shriver. Board your comfortable, air-conditioned coach at Washington DC's Union Station and travel 2.5 hours through the scenic Maryland and Pennsylvania countryside to Gettysburg, Pennsylvania. Listen to your guide provide historical background on the momentous Battle of Gettysburg during your drive. Fought in 1863, this three-day battle between Confederate and Union troops caused the highest number of casualties of any American Civil War battle â€” more than 46,000. Your first stop in Gettysburg is Farnsworth House, where you'll watch a presentation about what life was like for Civil War soldiers and see where Confederate sharpshooters hid out during the battle. After this visit, enjoy a break for lunch (own expense). Continue to the Gettysburg Battlefield and enjoy time to explore on your own. At the Gettysburg National Military Park Museum and Visitor Center, watch a film about the battle narrated by actor Morgan Freeman and see a variety of informational exhibits about the battle commonly considered a turning point in the American Civil War. Admire the Gettysburg Cyclorama, a stunning miniature military diorama that depicts the fierce battle with the help of narration and sound effects. Throughout your visit, expert guides are on hand to answer your questions about the Battle of Gettysburg and its aftermath. To get a fuller picture of the battle's impact, you'll also visit the nearby Shriver House Museum. 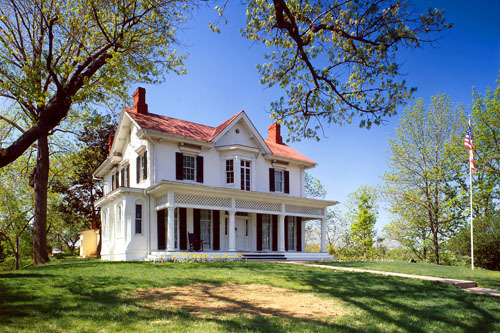 Tour the restored house of George Washington Shriver, located in the midst of the fighting during the Battle of Gettysburg. Learn about the harrowing experience of Shriver's family during the battle, visit the home's attic where two Confederate sharpshooters died, and see authentic Civil War bullets discovered in the house more than 100 years after the war. Relax on your drive back to Washington DC, where your 10.5-hour tour concludes at Union Station.